The catalog of App4Sales will be explained in this third training. After performing a full synchronisation with your backoffice, all your items will appear in the App 4 Sales catalog. This catalog displays all items with an image, items number, and item description. The practical stock indicators show the stock status, which allows you to quickly and easily see whether you can add an item to the order of your customer. Lock a position in the catalog with the bookmark icon to quickly return to the saved position. Browse through your items even faster and more efficiently and make it possible to show your customers even more items. All items within your catalog have a useful item card. On this item card, you can see information about the relevant item, such as the prices, stock information, or free fields. You can easily add the item to the order and apply discounts where necessary. The catalog of App4Sales also offers the possibility of using an item matrix. The item matrix makes it possible to display items that are sold in different sizes, colours, or styles in a comprehensive screen. Select multiple items at once and add them to the order. 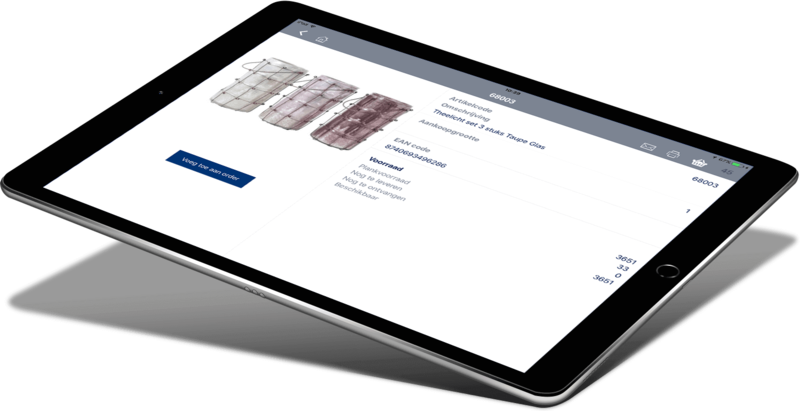 It is possible to apply various filters within the catalog of the sales app. Applying these filters makes it simple and easy to find the desired items. You can combine different filters to retrieve the right selection of items. All filters are taken from your backoffice and synchronised with App4Sales. If a customer is selected from the customer database, it is possible to retrieve a Top 100. This Top 100 displays the most ordered items of the customer in the catalog, which makes it easy to add regularly ordered items to a new order during a customer visit.